“Streaker” Red Dun Stud Colt with Wither Barring and Leg Barring. 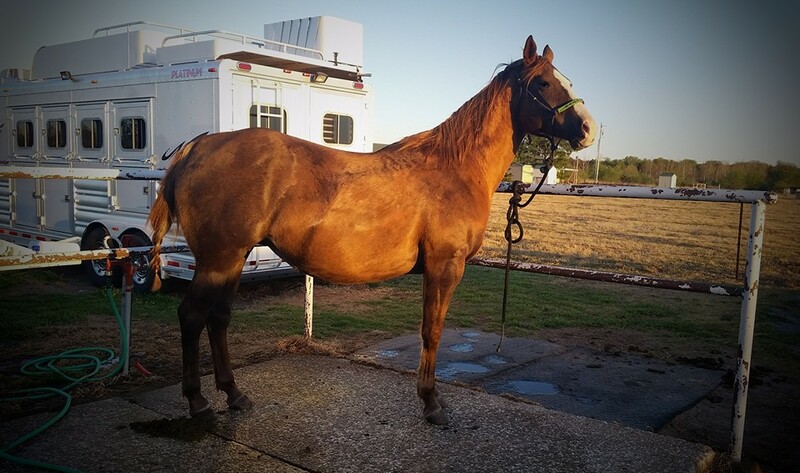 Gunny is out of Bailey By Yawl, a proven producing mare who has produced futurity money earners, WPRA money earners, Rodeo winners, and an arena record setter. She is by Lions Share Of Fame. King has $40,000 in barrel earnings and is by Dash Ta Fame out of the great mare On A Bunny who is by On A High and out of a Bunny Bid mare. He has two full brothers that are absolutely amazing: Gun Battle, who has won $600,000 on the track and was reserve champion in the All American Futurity, and FM Radio who has $75000 in earnings. Equistat all time leading stallion with LTE of over $500,000! 2011 Barrel Racing Report"Barrel Horse of the Year 4 Year old Stallion"
Gunny is un-shown due to injury. Her oldest foal will be 2 in 2018, a filly by the late (and great) Martha's Frenchman. We are planning to futurity her and eventually rodeo on her as well. World Champion producer, Sire of 2011 & 2012 AQHA World Champion LEAVE EM WISHIN as well as BRN4D Equine Classic Futurity winner. And other 1D performers from limited starters! MARTHAS FRENCHMAN, is a 1D winning son of the great FRENCHMAN'S GUY $5 Million sire. Out of Running Jessie Orchid, a proven barrel race and race producer with AAAT race earners of $12,000. MARTHAS FRENCHMAN's Maternal Grand sire is MARTHA SIX MOONS the sire of winners of over $2.7 million in racing and over $535,000 in barrel racing.